Deciduous seedlings offer gardeners and homeowners a way to add shade and flowering trees to the yard at an affordable price. 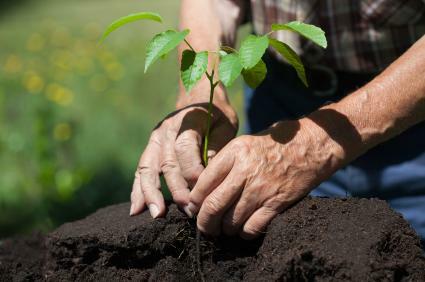 There are many benefits and some drawbacks to planting seedlings over mature trees. After considering the pros and cons, if you choose to plant deciduous seedlings, there are many varieties available online and in stores nationwide. Before considering the pros and cons of deciduous seedlings, it's important to understand exactly what the term means. A deciduous tree is one that loses its leaves in the wintertime; think of maples, oaks, dogwoods, walnut trees and many, many others. Seedlings are young plants grown from seed. The term seedling is loosely defined, but generally seedlings have only one or two sets of leaves, and a simple root system. Deciduous seedlings therefore are young trees of particular varieties that lose their leaves in the fall. There are several pros and cons to consider before purchasing deciduous seedlings. Inexpensive: Compared to a mature deciduous tree offered for sale "balled and burlapped" or container-grown, deciduous seedlings are an inexpensive alternative. Seedlings are available for only a few dollars, while mature shade container-grown shade trees will set you back tens or even hundreds of dollars, depending on the maturity, size and rarity or growth habit of the trees. A mature, slow-growing deciduous tree costs more because the nursery had to nurture it along for many more years than its fast-growing cousin, and consequently they'll charge you more for it. Seedlings haven't taken up as much time or room in the nursery and can be offered for sale at cheaper prices. Selection: Because of the complexities of growing, harvesting, selling and shipping mature trees, wholesale nurseries concentrate on only the most popular varieties used by municipalities and homeowners for street plantings and common landscaping use. If you have a hankering for a rare or difficult to find deciduous tree, you may be out of luck seeking it among the mature specimens at the local garden center. On the other hand, because they're inexpensive, garden centers and catalogs may take a chance on seedlings and order in some, and nurseries may offer a handful of rare or unusual trees among their seedling selection. Health: Seedlings haven't put down the deep root systems found among most deciduous trees. Consequently, they're easier to dig up, pack, ship and replant. They settle in well at their new location and if given some TLC for the first year after replanting, will eventually set down their deep roots and grow into healthy, robust trees. Shipping: Large specimen trees wrapped in burlap or grown in containers are quite heavy, bulky, and tall. They are shipped in tractor-trailers to garden centers from wholesale nurseries. The average homeowners pays extra to have it transported from the garden center to their home, or shipped from an online nursery to the home. Seedlings can be packed into small containers that ship easily through common carriers or the postal service. While buying deciduous seedlings offers many benefits, there are some drawbacks. Coverage: Seedlings are small, immature trees, and they take at least a few years to grow into a large enough tree for shade and coverage. You'll need to be patient if you purchase seedlings. They can take several years to mature into the majestic shade trees you desire. Higher Failure Rate: While it's true that the small, shallow root systems of deciduous seedlings help them acclimate to their new environment more easily than a mature tree, it can also lead to a higher failure or death rate, especially if the trees aren't watered well in their first year. The lower cost may offset the failure rate, but it's still disheartening to plant a tree and watch it die. You can find deciduous seedlings at home and garden centers nationwide. Nursery and garden centers may also offer a nice selection of seedlings. Plant sales and fairs may also offer a small selection grown by local garden clubs, master gardeners and other gardening enthusiasts. Your state forestry service may also offer seedlings; check online for the location near you and look to see if they have seedling sales. Many offer seedlings for sale at low prices in the spring and fall during optimal planting times. Some even have grants or discounts for planting various trees near rivers, streams and creeks as part of riparian restoration programs. Check with your state agriculture or forestry department for programs that may apply to your location. Heritage Seedlings, which carries a number of unusual deciduous seedlings. Pineneedle Farms, which offers a great array of deciduous trees. The Arbor Day Society, a non profit organization, offers many tree seedlings for sale or as a gift for a donation. Some trees are bare root and little more than sticks when they ship them to you, but with TLC, they flourish into lovely trees.